In this installment of Success Stories I talked with Rachel Epperson, owner of The Needle Shop located in the Chicago neighborhood of Bucktown. Rachel uses Facebook, Yelp, and Flickr to promote her business. She is also expanding into a blog later this month. 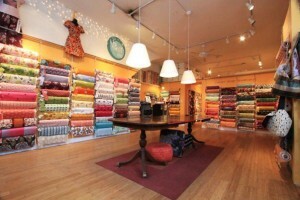 Read below to find out how she uses social media to grow her DIY sewing school and fabric store. 1.) Why did you first start utilizing social media for your business? How did your store change from before Facebook, Yelp, Flickr etc. to after you started using them? I was on Facebook like everyone else and it came up a lot in class. I friended a few students and they would ask me sewing questions via FB. Or, when they posted pics on Facebook of stuff they made I could see it too. Then, it seemed logical to make the Fan Page so we could all wow over each other’s projects and share tips. Now we just feel a lot more connected to our customers/students and in turn can know more about what they’re looking for. 2.) Do you use social media primarily to connect with customers you already have or to also draw in new ones? I’d say to connect, but I’m always happy when someone chimes in who I’ve never seen before. I do think students post pics of projects and their friends see and want to join in too. 3.) Which is your favorite social media application that you use? Right now, Facebook. It’s kind of catch-all. It funnels right into Twitter, so we get 2 birds with one stone. I’m really looking forward to the blog as well. 4.) How does Etsy play into your social media usage? How does Flickr? We link to our own Etsy pages a lot through FB and in our newsletter, so folks can see what’s new in the shop. I have a few complaints about Etsy, but overall, it’s been a HUGE bonus for us and saves us a lot of time selling fabric online, not to mention exposes a ton of people to our stuff. 5.) What are the biggest challenges to your social media usage? And what are your biggest lessons learned? Hm. I’m not sure it’s been challenging. It took a while to see what posts had the most impact and figure out what info people are interested in, but it was a natural learning curve. I think it’s fun, so it doesn’t seem like hard work. My job is always more fun when I’m connected to my students. 6.) What are your tips for a small business owner who wants to start using social media? Really consider who you’re talking to before you start. And listen carefully to their reactions. It’s such a give and take that you can’t get too many preconceived ideas about what to do. The point is to give them a voice, so you actually want to hear them! 7.) It looks like you are about to launch a blog. Why did you make that decision? What are you hoping to accomplish by attaching a blog to your business? In our industry, folks love tutorials. There are just an endless number of tricks to share that we can’t get them all into classes. I think our readers will always be excited to learn more stuff. 8.) What are your social media plans for the future? The blog, of course. And, I’d love to get more students posting pics on our Facebook fan page. I encourage them all the time to show off and remind them it’s how we all get inspired. They’re getting less shy, slowly, but surely. Thanks Rachel for talking to me! To learn more about The Needle Shop visit their website or follow them on Facebook and Twitter. Thanks for information, I just knew. For indeed I am a new blogger from Indonesia. Thanks! Hopefully I can take a valuable lesson from this blog. I’m glad you found it useful! Good luck on your blogging adventures.